Kinshasa/Brussels, March 13, 2006 - The international humanitarian aid organization Doctors Without Borders/Médecins Sans Frontières (MSF) is launching a massive measles vaccination campaign in Mbuji Mayi (Kasai Oriental province), the second largest city in the Democratic Republic of Congo (DRC). In only a few weeks, MSF teams will vaccinate an estimated 550,000 children under the age of 5. In January, a measles outbreak was identified in Mbuji Mayi, where an estimated 2.5 million people live.Since the beginning of the year, more than 1,000 new cases have been reported. After receiving information from the first exploratory missions, as well as authorization from the Congolese authorities, MSF began composing a team of 10 international workers and 500 Congolese staff to set up and run the vaccination campaign. The town is divided into 10 health zones, in which 102 sites for vaccinations have been identified. 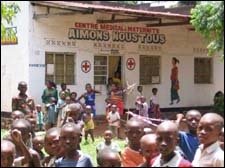 MSF is working in close cooperation with the Congolese Ministry of Health. In addition to vaccinations, free treatments will be provided to those children already affected by the disease. The aim is to get at least 85 percent of the children in affected areas vaccinated. In a precarious context such as that in the DRC, and in places where measles outbreaks are endemic, it is essential to increase vaccination coverage. "In a country devastated by a chronic humanitarian catastrophe, it is very hard to launch a massive vaccination campaign for 550,000 children between 6 months and 5 years of age," says David Goetghebuer MSF's Head of Mission in DRC. "We're talking about vaccinating a target population bigger than the total under-five population in countries like Sweden (415,000) or Switzerland (365,000) but with an extremely poor infrastructure. 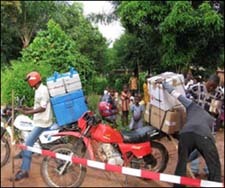 In Mbuji Mayi, transport by car is very difficult and most of the vaccination sites will have to be reached on motorbikes." "Our strategy is to move simultaneously towards two objectives: to launch the vaccination campaign and to guarantee a free and complete treatment for all the children already infected. These two steps are essentials to control the mortality rate and to reduce the spread out of the outbreak," says Goetghebuer. Worldwide, measles kill an estimated 450,000 people per year (an average of 1,200 per day) and the majority of them are children. Measles is one of the most contagious diseases known and almost all non-immune children contract the infection if exposed to the virus. 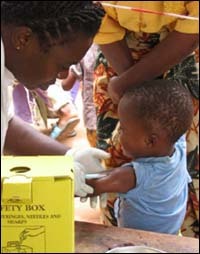 In the beginning of 2006, MSF already vaccinated 120,000 children against measles in the DRC's Bas-Congo province. In late 2004 in Equateur province, MSF concluded a campaign for more than 600,000 children less than 15 years of age. The campaign took more than a year to complete because many villages could be reached only by dug-out canoe.